Set on the corner where North, Damen and Milwaukee Avenues meet in Chicago’s Wicker Park Bucktown neighborhood, Café Robey is just one ingredient of the immense art deco tower that also houses the hotel of the same name. The wait staff are as attentive as America has taught us to expect, with a soupçon of elegance layered on top. Our water glasses never fall more than a half inch below brimful, and Mr J is called Sir so often he has trouble holding onto his composure. I start with the Ford’s Model cocktail, a reference to the Chicago Assembly, Ford Motor Company’s longest running manufacturing plant. 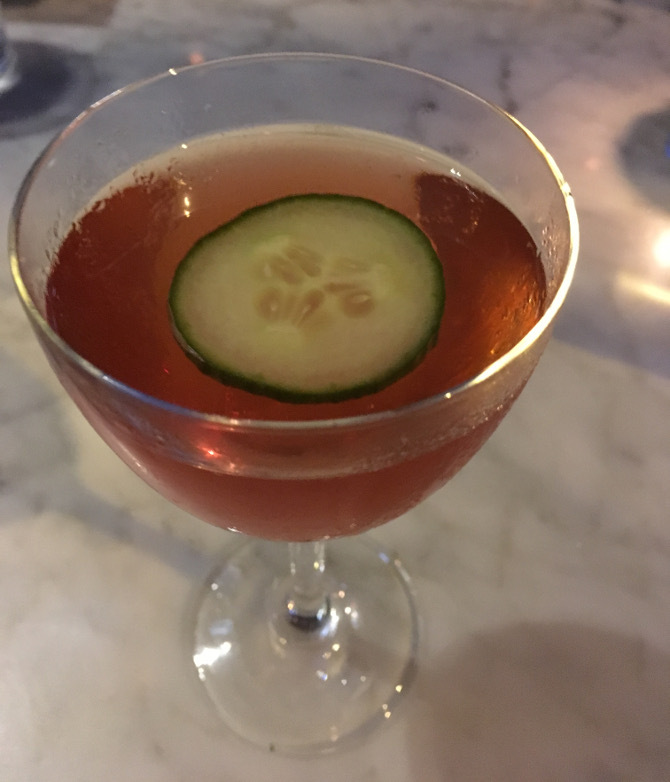 It may not sound like the most mouthwatering premise, but the cocktail itself, with Hibiscus Ford’s Gin, Chareau, Pierre Ferrand Dry Curacao, cucumber and 11th Orchard Pine Bitters, is as refreshing as stepping into an air-conditioned store after a stroll down Chicago’s Magnificent Mile, aka North Michigan Avenue. Mr J opts for a beer, taking advantage of America’s flourishing microbreweries. We find ourselves discussing the beauty of the glassware between sips and feeling just a touch Great Gatsby. I opt for the head-on prawn with fried green tomatoes, heirloom tomatoes, Acqua Pazza, Three Sisters’ Grits and fresh basil. The grits are crisp, the prawns deliciously meaty and the Acqua Pazza (yes, I had to Google that) delightfully light, but unexpectedly, it’s the heirloom tomatoes that steal the show, with a delicate juicy flavour that sweetly asserts their fruit status. Mr J chooses the gnocchi as his main, and raves about their crunchy exteriors and soft, moist centres. I can’t resist ordering the lavender-cured duck breast, accompanied by duck consommé, faro (a whole grain) fava bean succotash and kumquat marmalade. The whole dish taste wonderfully nutritious, the antithesis to the burgers and deep pan pizzas more commonly associated with Chicago cuisine. 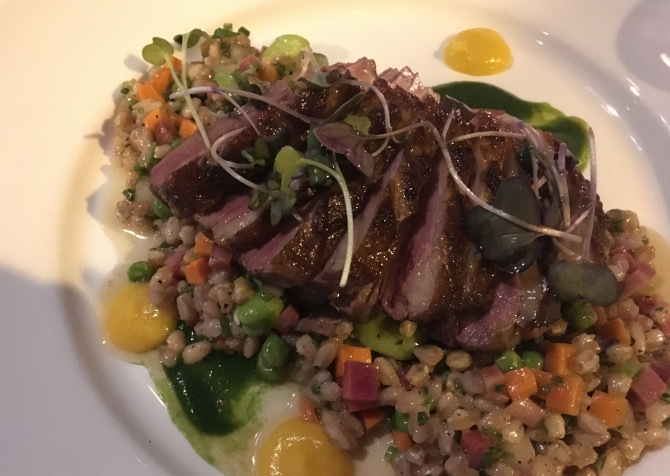 The duck is utterly luscious, while the succotash and faro add just the right amount of bite. 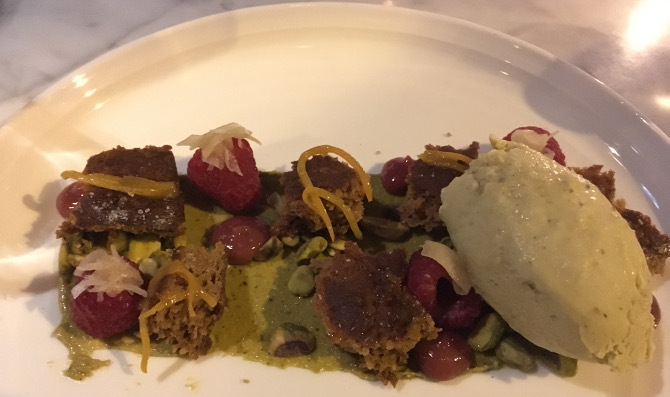 For dessert I’m all about the toasted cardamom honey cake, served in glistening wedges with moreishly rich pistachio custard, raspberry gel, zingy raspberries and thyme and lavender salt. It’s a texture and taste bonanza; my mouth has rarely been happier. At the end of our meal, we’re each brought a shot of milk and a cookie. Glancing around, I spot diners across the restaurant cosying up with their own cookies and milk. 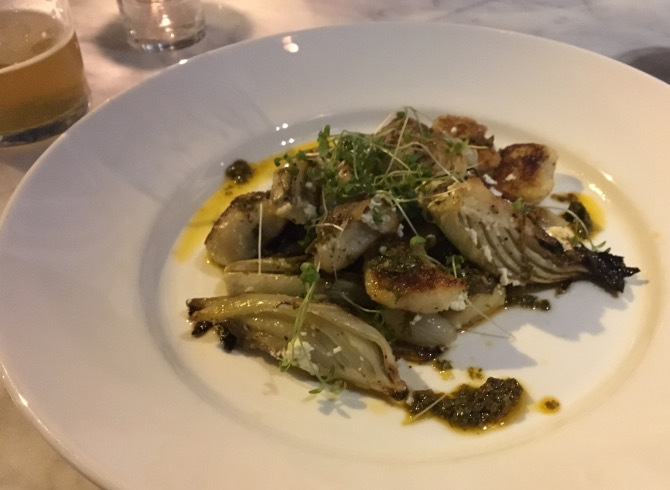 It’s an unlikely touch of comfort at such a chic establishment, but one received with as much appreciation as the finest gastronomic mouthfuls on this indulgent and imaginative menu. Got an inspiring venue, event, challenge, competition or call for submissions you’d like to draw my attention to? Send an email to judydarley(at)iCloud(dot)com.